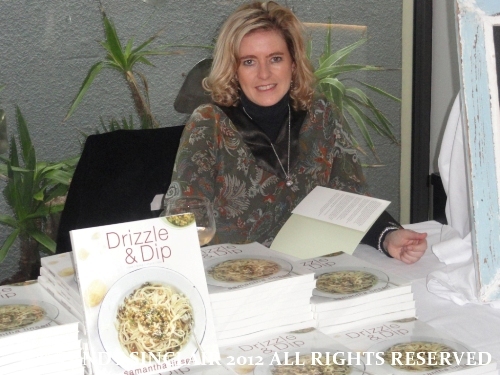 I got my first glimpse of Drizzle And Dip, the recipe book in June of this year and waited patiently for the launch to receive my own copy. Samantha gave this recipe book to me as a gift at her launch, and signed it for me. As soon as I had it in my hands I opened it to a random page and the first recipe I saw is one for my grandmother’s crunchies (page 89) and I knew immediately that this recipe book was perfect. You see, one of my favourite memories of my own grandmother has to do with her crunchies. Our grandmother’s recipes use exactly the same set of ingredients albeit it slightly different quantities. Sam’s best ever roast chicken (page 132) is definitely going to be on my list of recipes to try as every now and then it is good to do something different with an every day meal. Samantha’s forte is photography and her amazing photographs are alongside each of her recipes. It is the first thing that will grab your eye. The majority of the recipes are featured on a single page which makes it really easy for following. Each recipe has an introductory section, indicates the serving size and has clear instructions. The recipe book is separated into morning, noon and night and the recipe index is found at the start of each section. 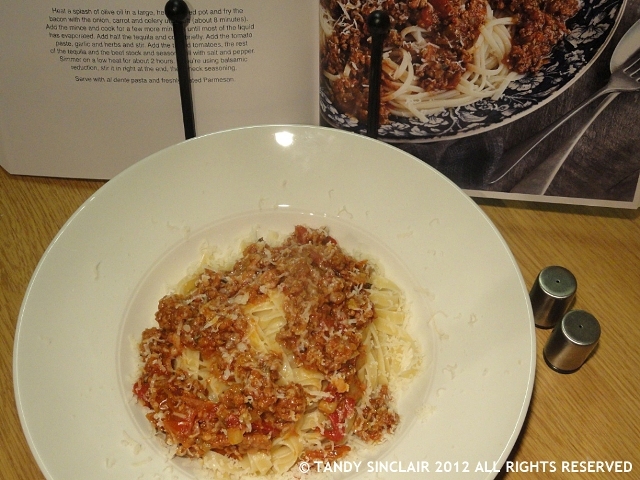 In order for me to review this recipe book, I chose to make tequila bolognese with linguine (page 116) and Sam has given me permission to reproduce the recipe here. I chose to use the fennel bulb. Next time I make this dish, I will add one red chilli finely chopped for some extra zing. As you can see, Sam and I use very similar recipe formats. This recipe book is available from all leading book stores, Woolworths, yuppiechef and kalahari.com. If you would like a copy and cannot find one, please email me! I’ve heard a lot of buzz about this cookbook, where can I purchase one? Amazon lists it as out of print :(. Would you direct me to where I can purchase 2 of them please? I wanted to buy Sam’s book and was so excited to hear that I will be getting one at Dinner Divas. It is a beautiful book! This dish looks so delicious!!! Tequila and Bolognese…sound very interestig!! I like variation to the usual theme. I’ve used Grappa once (I run out of wine), but never Tequila. This book sounds very interesting, I love good food pictures in a book..they inspire me!! A great & tasty pasta recipe! Thanks so much for sharing this deliciousness! Now I want to try that roast chicken recipe! I never made ragù bolognese with tequila. se si tenta, per favore fatemelo sapere cosa ne pensate! What an outstanding book Tandy and how special to receive one as a gift. how does the tequila impact on the flavour? Is it only a subtle taste?